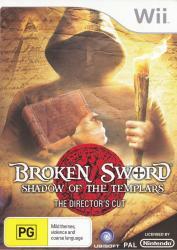 Broken Sword: Shadow of the Templars � The Director�s Cut for Wii builds on the original, boasting a new and explosive narrative interwoven with the first story. After witnessing the brutal and horrifying murder of one of Paris�s richest and most influential statesman, the player will be pulled into a sinister conspiracy rooted in a long forgotten medieval legend. New puzzles have been added that specifically utilize Nintendo's unique Wii Remote. The game also features stunning animated facial expressions drawn by Dave Gibbons, artistic genius behind the comic book and upcoming movie Watchmen.